The Red River Parish Courthouse is located in Coushatta, Louisiana. 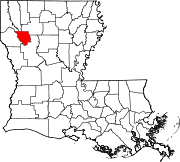 Red River Parish (French: Paroisse de la Rivière-Rouge) is a parish in the U.S. state of Louisiana. Its seat is Coushatta. It was created in 1871 by the state government. As of the 2010 census, the population was 9,091. This page was last changed on 16 September 2018, at 18:49.